The housing market favors sellers from now through mid-May more than it does during any other time of the year. Although the real estate industry claims that the Spring Market officially kicks off right after the Super Bowl ends, it is not as if everybody moves from cheering for his or her favorite team to entering the real estate fray. That’s not how the real estate market unfolds. Instead, demand starts to take off in January. In the blink of an eye, Starbucks holiday cups are gone, and all the ornaments are tucked away. Emerging from the fog of holiday distractions are buyers eager and ready to purchase their next home. 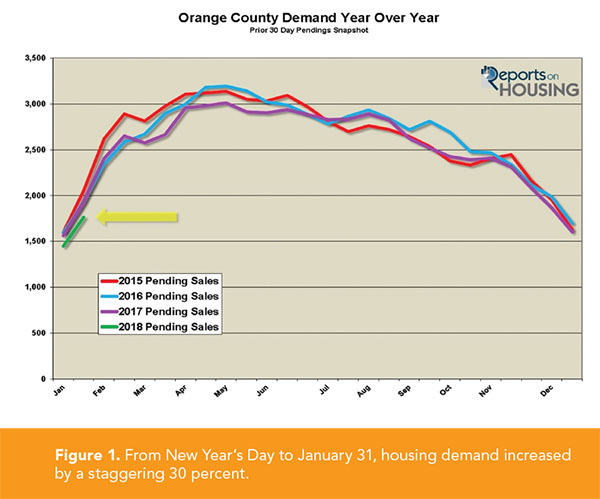 From New Year’s Day to January 31, housing demand increased by a staggering 30 percent (see Figure 1). On the other hand, the active inventory increased by only 12 percent. To understand why the market is changing so rapidly, let’s dust off that old Econ 101 book that describes supply and demand. When there is a lot of supply and very little demand, prices fall, which favors buyers. When there is very little supply and tremendous demand, prices rise, which favors sellers. Since 2012, the supply of homes on the market has been severely constrained and the demand, propped up by historically low interest rates, has been through the roof. When the supply of homes is low and the demand to buy a piece of the “American Dream” is high, the expected market time falls. That is precisely what has occurred so far in 2018. 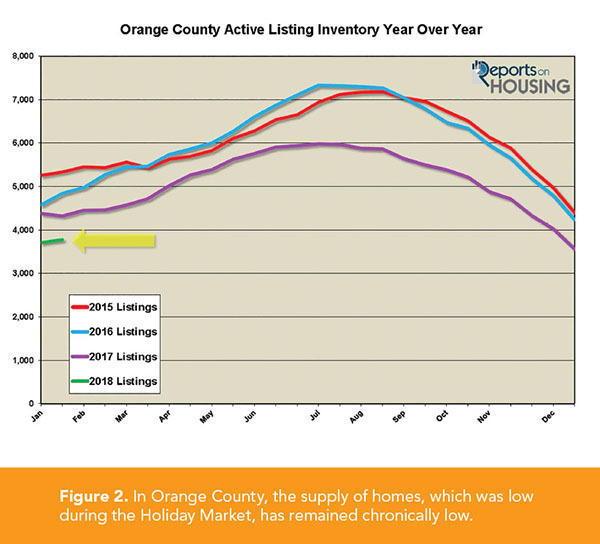 During the Holiday Market, the supply of homes was low and so was demand. Buyers were distracted by the holidays and diverted their attention away from housing. Now that the holidays are in the rearview mirror, the supply of homes has remained at chronically low levels, while demand has risen rapidly (see Figure 2). As a result, the expected market time—that is, the amount of time it takes from placing a home on the market to opening escrow—has dropped like a rock. 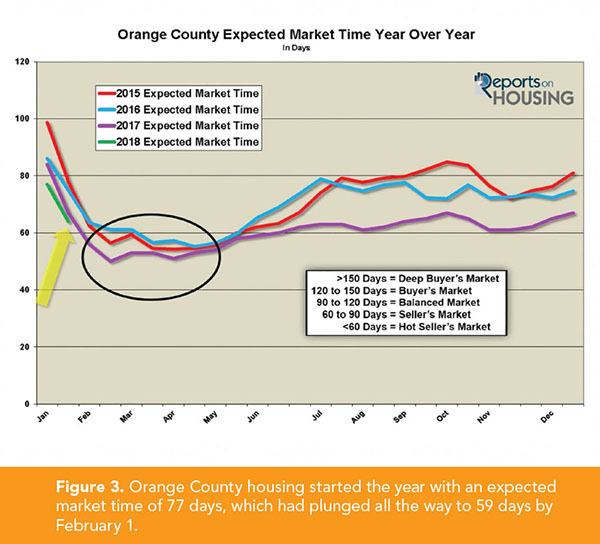 Orange County housing started the year with an expected market time of 77 days. This number had plunged to 59 days by February 1 (see Figure 3). A market time below 60 days is considered a deep seller’s market. It was already a deep seller’s market before Super Bowl Sunday. Slowly but surely, the housing market evolved from a slight seller’s market to a deep seller’s market, and from about mid-February through mid-May became the absolute best time of the year to sell. That is when the expected market time drops to its lowest levels of the year, and homes fly off the market at the fastest annual rate. From mid-May through June, a deluge of sellers comes onto the real estate scene. Their total exceeds the number of pending sales, so the expected market time actually rises. Going back to “supply and demand,” the demand for homes remains steady and strong while the supply of homes on the market increases. As a result, the expected market time rises. It is still a great time to sell, just not as hot as earlier in the year. From July through the remainder of 2018, the expected market time will remain elevated. It is extremely important to note that placing a home on the market during the hottest time of the year does not guarantee success. It is still all about price. When sellers price their homes too aggressively, they sit on the market and do not entertain offers to purchase. The sellers of a stunning 25 percent of all homes that have been placed into escrow so far this year had to reduce their asking price at least once. When the market is hot, carefully pricing a home close to its Fair Market Value is the absolute best way to approach the market. This can be accomplished by diligently analyzing recent comparable pending and closed sales and not giving too much weight to active listings. 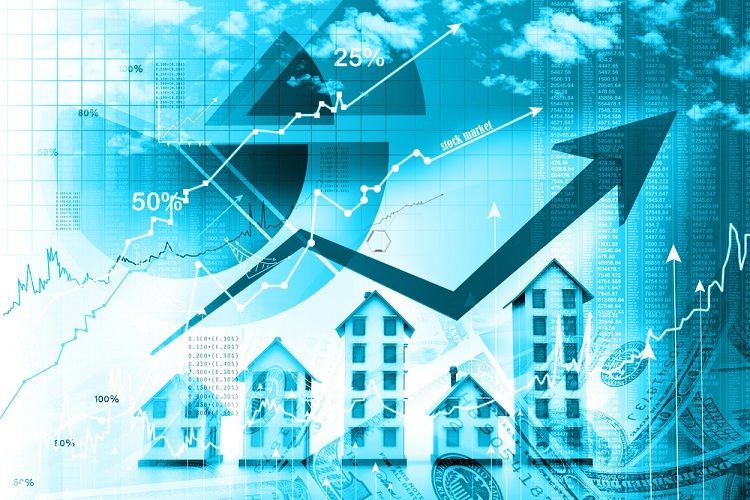 A realistic price will attract multiple offers to purchase and, oftentimes, will allow a seller to fetch a sales price at or higher than the active listing price. The market is not tilting in favor of buyers and will not do so anytime soon. Buyers should approach the market with a ton of patience and the mindset that they will eventually prevail. It may take writing offers on ten different homes but, in the end, will be worth it. Interest rates are still historically low, but this gift will not last forever. Waiting is not the answer.